Colleen Conners-Pace is a born native of Tahoe. She enjoys taking advantage of all what Tahoe and the Sierra’s seasons have to offer. Colleen is happily married, has a beautiful golden retriever both who love to train and play as much as she does. Colleen has always been active from an Alpine racer in her youth to now an ultra distance endurance athlete. Colleen’s love for endurance events began in the late 70’s. Her claim to fame is running the Western States 100 mile run in under 24 hours, finishing 3rd overall woman garnishing the coveted silver belt buckle. Throughout the years Colleen has competed in many ultra running races and triathlons. 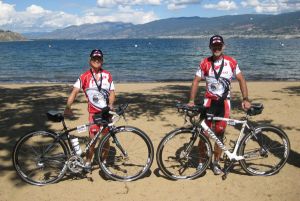 Colleen competed in many of the first annual triathlons in the 80’s such as in 1981 the first annual Donner Lake Tri which is now a Big Blue event, where they actually swam then ran around the lake then rode up the summit to the freeway back to top of summit where it ended. Back then it was thought to be too dangerous to ride down the summit. Colleen entered the lottery for the Ironman in Hawaii in the late 80’s but was unfortunate not to be drawn. But this fortune changed in October 2008 when Colleen went to Hawaii to volunteer in the medical tent for the Ironman to attend the Ironman Sports Medicine Conference. At the conference, she was the lucky sole lottery winner for the opportunity to participate in the 2009 Ironman Hawaii World Championships. A dream come true. Colleen recently just participated in Ironman Canada 2010 with her husband, Joe. In 1997 Colleen received her Masters of Arts degree in Exercise Physiology with an emphasis in Adult Physical Fitness and Cardiac Rehabilitation. She currently works at Sierra Internal Medicine, Incline Village, in the Cardiac Rehabilitation Dept at Tahoe Forest Hospital, and has her own sports performance business, Tahoe Peak Endurance. Tuesday and Thursday. See www.tahoepeakendurance.com for detailed information on testing, coaching, training and for Primal Fit. Colleen enjoys working with a variety of folk from those who have suffered major heart attacks to those that aspire to be more fit, to be a better athlete and reach peak performance, educating all who pass in her path on how they can improve their wellness, health, fitness, and performance. Colleen’s thoughts on her Hawaii Ironman experience. the event went so well, picture perfect, can only believe that it was the right time in my life. Dreams may lay dormant for awhile but don’t give up on them, sometimes they just happen”.